In conjunction with Castle Triathlon Series, we are pleased to offer 30 minute sessions of open water swim and transition training, designed for 8-16 year olds. This is a great opportunity for those who have not swum in open water before or are apprehensive about the transition and would like to build confidence and technique before the race. 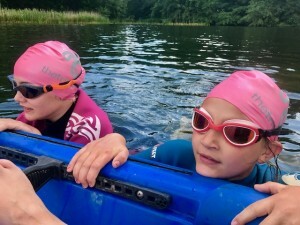 Starting an open water triathlon with confidence is key for every competitor, but children particularly like to know what to expect and feel adequately prepared. This is a great opportunity for young athletes who have not swum in open water before or are apprehensive about the transition and would like to build confidence and technique before the race. Please be advised that if you are unable to attend the event we are unable to offer refunds or transfers to an alternative training day. Is there an alternative method of payment? Automating registration and payment via PayPal or credit/debit card helps us keep prices down. So for these low price events, I’m afraid we only accept online payment. If you are unable to make the event, you may transfer your ticket to a friend/training buddy/family member. Just drop us a line at least one day before the event with their name. If my child is injured, can I defer their place to next years Training Session? We can swap your booking to 2020 up until the 7th of June 2019. After that your place can only be transferred to someone else or cancelled as we would be unlikely to be able to re-sell the available training session slot at such short notice.